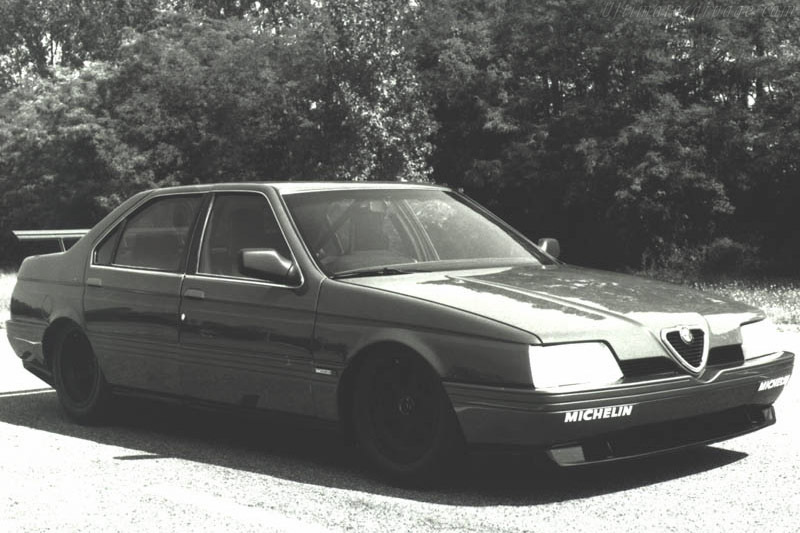 #TouringCarMadness – The V10 Powered Alfa Romeo 164. – Historic Motor Sport Central. Back in 1988, the idea to recreate the ProCar series as seen in 1979 and 1980 as support races for Formula One Grand Prix weekends came arround. Back in the days, the idea was put together by BMW Motorsport and Jochen Neerpasch to put together a grid of identical cars, with touring cars and sportscars stars to race against the best of the Formula One grid. Of course, the mighty BMW Motorsport baby, the M1 “ProCar” would be used for a fantastic marketing project which proved very successfull to the drivers and crowds but which only lasted two season and 18 races altogether but that’s another story…! Copyright ultimatecarpage.com & Dutch Alfa Romeo Owners Club. Bernie was the man behind the project as he was also the man behind the commercial aspects of the sport already through the FOCA. The project was although backed and announced by the FIA as well. The idea was to resurrect the ProCar series as a championship for major manufacturers supporting the Grand Prix weekends and using Formula One powertrain, the 3500cc formula in what was to be a “Silhouette” series, yes, the car would look like production one but would share all technical aspects with the Formula One regulations. Centrally located engine, carbon fibre brake, state of art chassis. Only the aerodynamics would have to remain as stock appart from a wing which could be fitted at the back. In a way, the idea was great, it would allow manufacturers to race in both series, one to use the “Win on Sunday, Sell on Monday” theory through the ProCar and the other was to attract them to race in Formula One as engines were basically the same. Unfortunatelly that never materialized and the series never happened as it proved too expensive to participate. The reason was simple, it was to be a serie of Formula One with a bodywork so all technologies were as expensive and for that sort of money, Formula One had more appeal. The other fact is also that touring car racing was then at its peak with the ETCC and national championship such as DTM proving to be a much better playing field and cost effective formula for the manufacturers..! Talking about the car now. 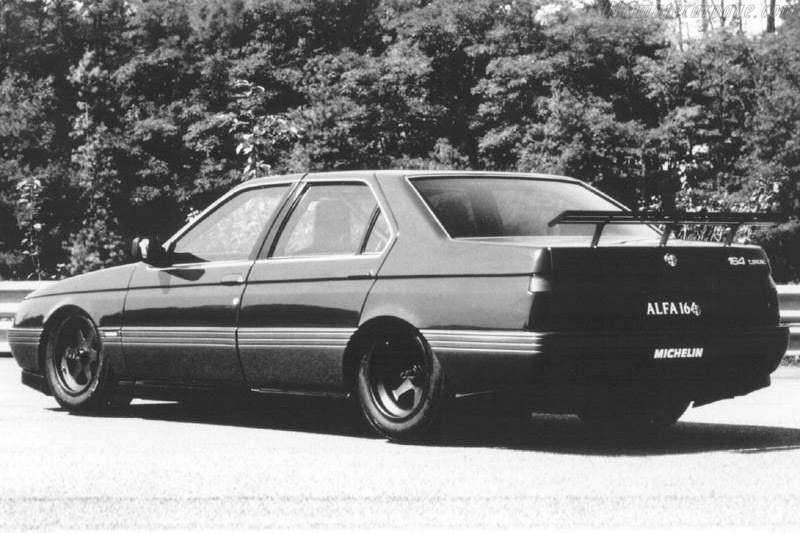 Well, the Alfa Romeo 164 is typical of the 80’s italian design. Square and elegant, well, that’s what they thought back in the days. Funny about the car and Bernie involvement in the project is that it is said to have been developped with help from Brabham and that the engine was sourced through his old tie with the Italian marque from the days they powered the Formula One team. 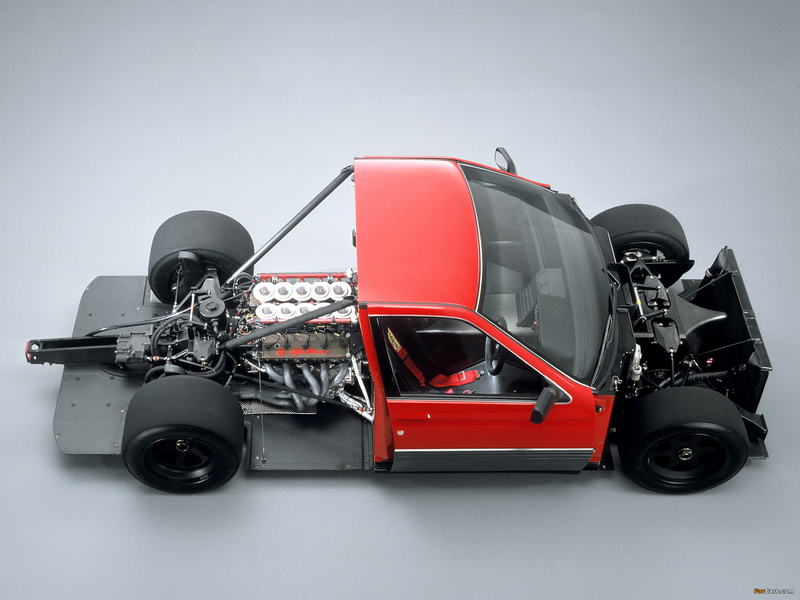 The barely dressed ProCar Alfa Romeo 164. Technically, the chassis was a monocoque made of aluminium honeycomb and nomex reinforced with carbon-kevlar as was the trend in sportscar racing and also Formula One. Front suspension consisted of lower and uper wishbone with pushrod activated in-board mounted dampers and the same for the back except that the dampers were mounted to the gearbox casing as for most Formula One design of that period. The car also featured carbon brake discs at four corners. 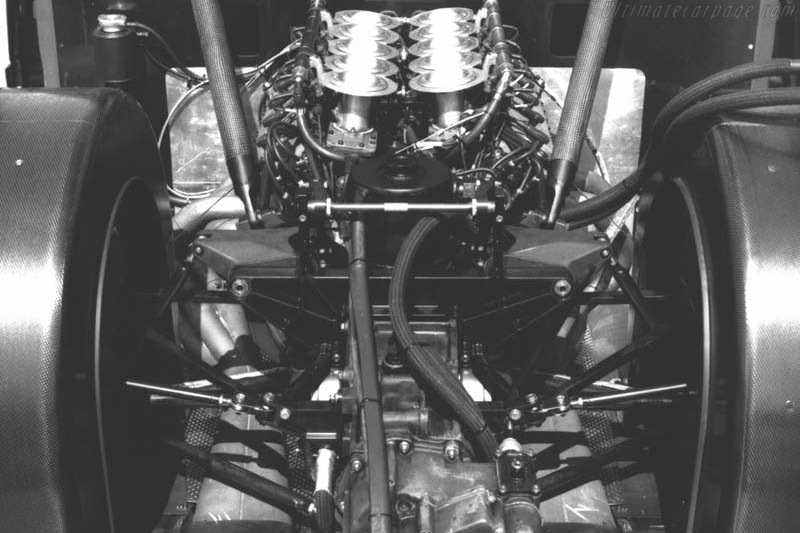 The engine was the Alfa Romeo illborn 3500cc engine designed for Formula One purpose, a 73°V with 4 overhead camshafts and 40 valves, 4 per cylinder with Bosch ignition and fuel injection. Gearbox was a 6 speed Hewland manual gearbox. Bodywork had to remain stock and if you look carefully it did look stock appart from that rear wing fitted to the trunk. All that body was made of carbon fibre to add lightness. The doors, bumper, rear-view mirrors were exactly the same as production one but made of a lighter material. 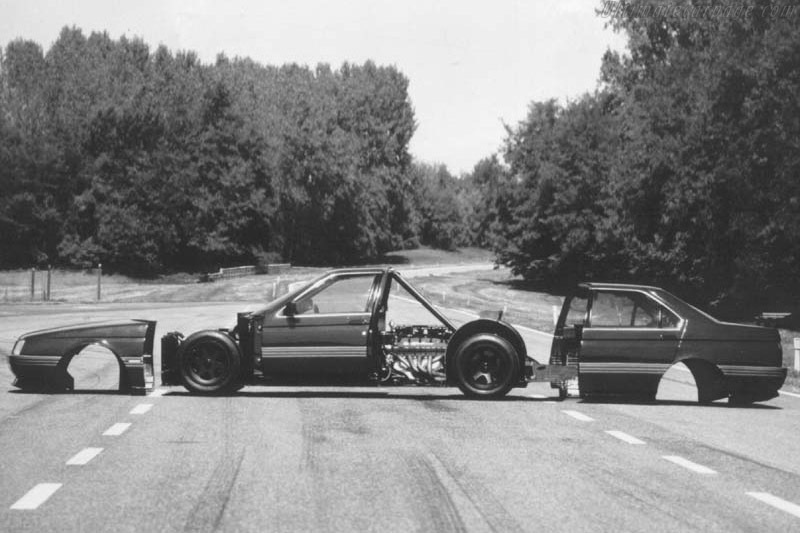 That is the reason the whole concept had to stand on 17-inch wheels and Michelin tyres, the body was too small for Formula One wheels and tyres. Basically if you’ve read that article, you now understand why it couldn’t work. Formula One technology everywhere so huge costs to build a car and run a team and no one interested. It is said to have cost Alfa Romeo more than 350 000 $ at the time and that was huge money in 1988 ! But one thing, with that aero and the power of the engine, it would have been a fantastic series with a simple look at the figures, 605 HP, 750 kg and a top speed of 350 km/h. What comes to my mind thinking about that is one simple thing, #OhGod ! See it at speed here. If one day I can afford to buy and find it, that will be my ride to the grocery store #OhYeah ! Previous Previous post: #PurpleCat – The 1991 WSC Jaguar XJR-14. Next Next post: #MotorsportFail – The 1991 WSC Konrad KM-011.